Shop our wide assortment of baby boy gifts all priced under $100. With lots of unique designs and themes to choose from, you are certain to find the perfect shower present or welcome home gift for any new baby boy. 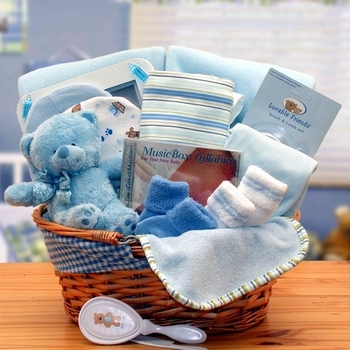 Choose from exclusive clothing ensembles, gift baskets, nursery items and more. Our gifted designers use only the finest quality items when creating these adorable masterpieces. You will also find many creations with the option to have them customized with the baby�s name and more. These personalized versions add individuality creating an heirloom and this special touch makes it mean so much more to the new mom and dad. All of our gift selections include a money back guarantee of your satisfaction and your entire order will always be shipped at no additional charge.